At the end of a long day, as I turn out the lights and head towards my bedroom, I think about what a busy day I had and how I can’t wait to get under the covers in my bed, turn on the tv and relax. As I approach my bedroom door, I’m almost giddy with excitement. The only thing that could ruin this desire to relax after a hard day is to walk into a cluttered and untidy bedroom. I’ve had times in my life where I have not always kept a clean bedroom. After a long day or night out on the town with friends, the last thing I want to do is to look at clothes on the floor, laundry sitting on the bureau, or stacks of bills on the nightstand. There’s no denying that a messy bedroom can have a negative impact on one’s state of mind. Over the years I’ve learned a thing or two about how to keep a bedroom clean so that my little oasis, the spot in my home that is peaceful and calm – my escape sanctuary – stays that way. 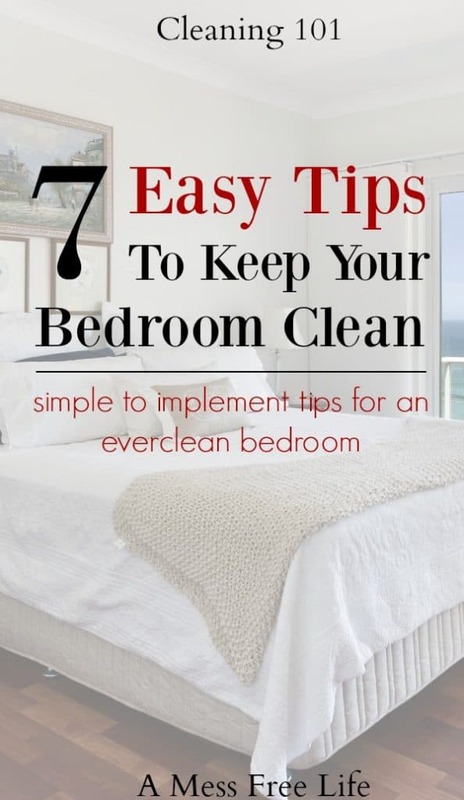 I adopted these habits and today I’m going to share 7 easy tips plus a few bonus tips to keep your bedroom clean. Have you ever walked into someone’s bedroom and it was filled to the brim with storage boxes, cartons, and junk? I have and there is nothing inviting me to want to go to sleep in that room. Your bedroom shouldn’t become a storage facility for everything you can’t find a spot for in your home. If you use your room in this way, it will be difficult to keep it clean and tidy. Take a day and clear out the clutter from your room and find a new place for them, or better yet, sell, donate or toss what you no longer need or want. Purging your environment and creating a space that you’ll enjoy coming to at the end of the day, is one of the best things you can do for yourself. If your house is less than clean and organized, cleaning your bedroom will give you that little piece of heaven that has been missing. My daughter has a small condo and as such needs to utilize every single bit of space in her home. She recently purchased under-the-bed storage to store clothing that she wants to keep but doesn’t wear every day anymore since she works from home. If you have to store items in your bedroom, purchase the appropriate storage containers for under the bed or closet storage solutions. Furniture surfaces are not quasi-storage areas. The tops of nightstand and bureaus should remain clutter free and only hold the essentials you need. My nightstand has a lamp, my hand lotion, my before bed supplements and usually a book or two. My dresser holds perfume and a small jewelry box along with my mother’s medications. My nightstand has a lamp, my hand lotion, my before bed supplements and usually a book or two. My dresser holds perfume and a small jewelry box along with my mother’s medications. Having a limited amount of stuff on the tops of your furniture makes it super easy to dust once a week. Remember, one of the habits of people who always have a clean home is to dust and vacuum once a week. Removing clutter will make this possible. Making your bed at the start of the day is an important first step in starting the day off right. It takes virtually two minutes to make the bed and the room looks instantaneously improved. Did you know making your bed actually helps to motivate you to keep your room clean. If you’re one of those people who believe in “airing out” your bed, I have a solution. Go about completing your morning routine. Shower, shave, do your makeup, etc. After your done and before you head out the door, pull the covers up, put the comforter in place, fluff the pillows and you’re done. Make your bed each morning and you’ll be amazed at how great your room will look. In the few minutes it takes to make the bed, you create a neater room almost instantaneously. Nothing makes a room look a mess more than clothing on the floor. You immediately feel the disorganization of the environment when clothes are left there. Please, please, please stop throwing your clothes on the floor. Put a hamper in your bedroom if that’s where you get undressed each night or the bathroom. 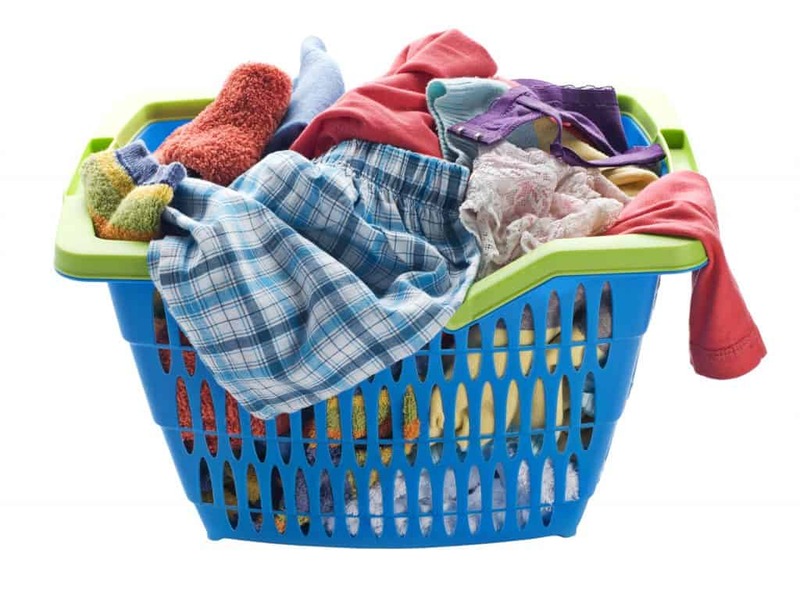 It takes just as much time to throw your clothes in the hamper as it does to toss them on the floor. Toss your clothes in the hamper and your room will look better at the end of the day. Instead of flinging your shoes off and leaving them where they land, try putting them away in your closet or on a shoe rack. Keeping them off the floor will also lend itself when it comes time to vacuum your room. This small task will only take a few seconds but will make your room look neat. Here is a storage solution that might work for you. This is the exact shoe organizer I use in my closet and I love it because not only does it hold shoes, but you can fit your pocket books in the middle. It’s a double duty organizer! This is a particular pet peeve of mine. When I first started my house cleaning business, I had this family who never required their kids to put away their clothes. On their bureaus and dressers, were clothes piled so high you couldn’t see the mirror. It was ridiculous and it made the room look messy despite the fact we had just cleaned the room. Putting your laundry away is worth the time it will take to make your room the sanctuary you deserve. I know lots of people like to grab a bowl of ice cream and head upstairs to watch the Late Show, but try and resist. Eating in bed typically means you end up with a collection of glasses, bowls, spoons and more. It attracts bugs and ants into your sleeping quarters and nobody wants that! Leave the eating to at the table and you’ll never have to worry about uninvited guests in your bedroom. First, make sure you have a garbage basket in your bedroom. But then don’t forget to empty it! Also, take the time to throw things out that you otherwise would leave hanging around dressers and nightstands. This way your room is always free of clutter and trash and looks impeccable. Taking the time to implement these tips will ensure you have a great place to go to at the end of a stressful day. Don’t think you have to implement all seven. Start with one and implement a new tip each week. It might take you a little longer to create your oasis, but you’ll be making progress towards a clean and neat bedroom.